Along with the change of the release schedule came release terminology changes. Microsoft announced that it would replace the two terms "Current Branch" and "Current Branch for Business" with "Semi-Annual Channel (Pilot)" and "Semi-Annual Channel (Broad). This is why the Windows 10 Creators Update falls under the Semi-Annual Channel servicing option already. Enterprise customers who can't or won't follow Microsoft's twice per year release schedule may select to use Long-Term Servicing Branch (LTSB) instead. These are updated less frequently, two-three years is the schedule according to Microsoft, and are supported for 10 years. The next release will be in 2019 according to Microsoft, and it won't be called LTSB anymore but LTSC. LTSC stands for Long-Term Servicing Channel, and it is the new term for that special branch for Enterprise customers. This was done so that the name falls in line with the Semi-Annual Channel name changes earlier this year. Semi-Annual Channel -- will be supported for 18 months from the date of release. Long-Term Servicing Channel -- will be supported for 10 years from the date of release. Windows as a service is an ongoing process according to Microsoft that sees new versions of the operating system released and old ones retired regularly. Microsoft will release two feature updates per year, in Spring and Fall, and monthly updates that are cumulative on top of that that introduce security updates and bug fixes. Microsoft suggests the following servicing process for organizations that don't use LTSC versions of Windows 10. It is a rinse and repeat process that never ends and repeats every six months. Plan and prepare (evaluation) -- Use Windows Insider builds to follow Windows 10 development, validate compatibility, and provide feedback. 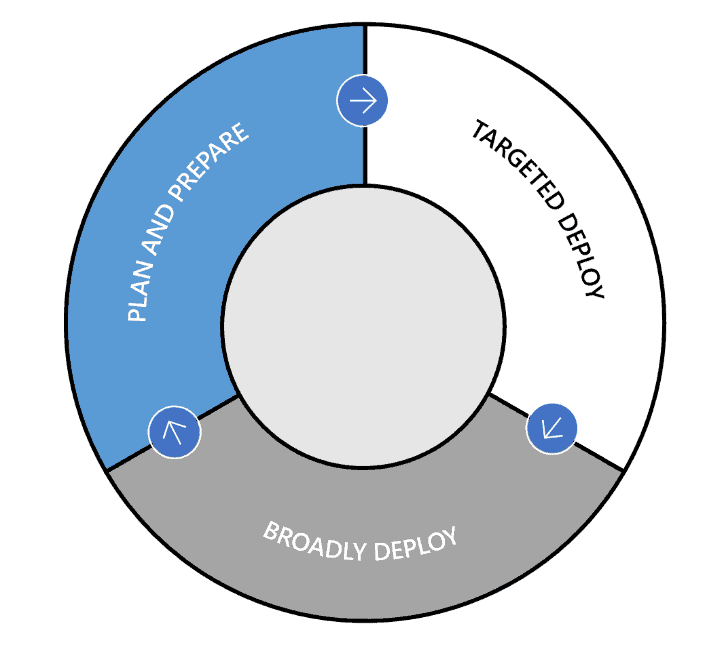 Targeted deploy (piloting) -- Install Semi-Annual Channel (Pilot) releases on targeted machines to validate the new version of Windows 10, and to make sure that programs, hardware, and infrastructure are compatible. Microsoft suggests to deploy the new version on around 10% of devices). Broadly deploy (broad releasing)-- Begin broad deployment of the new version on all organization PCs. Microsoft announced that it renamed the Long-Term Servicing Branch (LTSB) servicing channel to Long-Term Servicing Channel (LTSC). I wonder; would they still force such a system on users and businesses alike if they had two competitors at 30% market share each ? Either way, we at least have LTSC. I hope it doesn’t have compatibility issues with drivers or software though. I use LTSB 1607 on a Ryzen 2200U notebook. It’s interesting a bit. Because these AMD APUs are relatively new and AMD has a general bad reputation for its lazy driver developement, one cannot know for sure what causes some problems. When I purchased it, it crashed when I tried to mirror its picture to an external monitor. Now it is better, however it can present the image on only one screen (ext. OR int. ), but not both. But, on the other hand, you can easily install anything, Office, Avast, you name it, it can even run games like Skyrim and GTA IV. The latter runs horribly though, partially because it was not optimized well. So I never felt restricted becasuse of its nature of being LTSB. I have an assumption according to which because it is 1607, you won’t be able to get the most recent drivers. Maybe that causes my problems, but I’m not sure. Overall, my impressions are good, it seems to be the best version of W10. I guess if you’re a Windows 10 user you will never again be truly alone. Welcome to the Microsoft Family. What a mess of an OS. Everything about W10 (constant updates, name changes, half finished functions and multiple version designations) are specially designed to “soften up” consumers for the inevitable “Pay-Per-Click Cloud OS” version that MS has been fantasizing about. Microsoft doesn’t know what they are doing. Hoping they sort this mess by 2023. If – for whatever reason – you want to get W10, I would certainly recommend the LTSB build. It does what an OS should do – offer the basis for programs and not annoy the user. A task that seems too hard to implement in normal Windows versions. You have to activate it via other means though, but once that is done you have a reasonable OS. I use the LTSB and it is indeed the proper version without annoyances and harassments and useless stuff. I’ll stick to it unless other versions comes up with something really really really interesting. LTSB/C is the way to go in Windows 10. M$’s new emphasis is on “SEMI ANNUAL” = twice yearly upgrades = EOL of 18 months for each new Version of Win 10.
. If for whatever reason, a consumer’s Win 10 computer could not be upgraded to the next version, it will be EOL-ed after about 1 year, eg the OEMs end support for their devices which are more than 4 years old, buggy Windows Update that bricks a Win 10 computer during the upgrade, faulty Internet connection during the upgrade, etc.
. Since a late 2014 policy change, corporations who buy Win 10 Ent E3 Volume Licenses(VL) for the first time are required by M$ to also buy the 3-year Software Assurance(SA) or Upgrade Insurance at least once. SA entitles corps to a “free” one-time upgrade to a new Win 10 Ent Version within 3 years. Since each Version of Win 10 has an EOL of 18 months, the corps will have to take the “free” SA upgrade within 18 months and not the maximum 3 years. ……. Win 10 Ent E3 VL without SA cannot upgrade to the next Version = have to buy new VL. So, the affected corps may be compelled to continue buying the 3-year SA every 18 months or opt to lease/subscribe Win 10 Ent or to buy the super-expensive Win 10 Ent E5 VL LTSB/LTSC. Previously, corps who bought the 2006-released Win Vista Ent VL could opt to buy SA once, upgrade to Win 7 Ent VL for “free” after 3 years(in 2009) and continue to use Win 7 Ent until 2020 = a total of about 13 years. This scenario is no longer possible with Win 10 Ent E3 VL. IOW, consumers running Win 10 likely got conned(ie EOL may not be 2025) and corps buying Win 10 Ent become like corps’e being drained of blood money. I wish they gave more attention to improving their OS than to playing with names. If there’s a prize for creating maximum fog and confusion among users by continuing to change terminology, Microsoft is gonna win it! w10 is always a beta version, regardless of different naming. Seriously everyone just switch to Linux already! Linux Mint if coming from Windows. elementary OS of coming from Mac. Persuade the developers to port their softwares and games to Linux with Ubuntu in mind as standard platform. More ppl do it the better, chances are they will port to Linux. If they still don’t and make silly excuses like Linux desktop market share 2% is too low, just stop buying their software and game. Those developers are forgetting that they are the reason Windows desktop market share is so high. Operating Systems can’t generate market share by itself, it relies on developers who make softwares and games for that OS. PS Linux market share is actually +90% cuz same Linux kernel is used in server, desktop, mobile, etc. just customized/configured in Linux distributions. Linux is a kernel. I think they are not saying it publicly cuz they are afraid of malwares. Windows is a paid-software = very user-friendly to users and System Admins. For a medium to large company, deploying Windows requires only a few System Admins and a short training period for its staff/employees. Free Linux is the opposite, ie requires more and highly-knowledgeable System Admins and a longer training period for the employees. For Linux to succeed, it should be as user-friendly as Windows = Linux should follow M$’s or Google’s business model, ie charge some license fees or rely on ads, marketing data sales and app sales commission income. ……. Only with a sizable market share, will software/app developers and OEMs follow, ie in terms of support. The chicken must come after the egg. > Windows is a paid-software = very user-friendly to users and System Admins. Dude, “paid-software = very user-friendly” is a ridiculous statement. And ridiculously wrong! Based on your ridiculous statements, It seems unlikely to me that you have much (any?) experience administering Win10 systems in any company of any size. Based on your ridiculous statements, It seems unlikely to me that you have much (any?) experience administering Linux systems in any company of any size. Fyi, Google, Facebook and Amazon run Linux systems with highly-knowledgeable Linux System Admins, and not Windows systems. ……. Based on your ridiculous statement, it seems unlikely to me that you have the qualifications to be a Linux System Admin and work for companies like Google, Facebook and Amazon. This position will play a key role as part of the team responsible for operating our clients computer systems, including system administration duties for account processing and online banking systems, and monitoring the performance of the organisation`s banking and non banking systems. You will also help with performing backups and restores, as well as carrying out Active Directory and Exchange administration, and server security patching. With a number of hands on` operational process based tasks, you must have excellent attention to detail, be organised and methodical and demonstrate a track record of maintaining systems from operational perspective, including following detailed operational procedures. In-depth knowledge of Windows Server 2008/2012, Active Directory, Exchange, Symantec Netbackup, Server Administration, and VMWare would be an advantage. The ad for linux admin is an engineering advertisement by description. Either they want to hire an skilled developer/engineer or they’re quite stupid. Either Linux people think linux developers and admins are the same or linux developers/engineers are cheap enough to also use as admins. The windows system admin advertisement is an actual ad for an administrator. I don’t think the above poster was questioning the widespread use of linux. (That would be hard to do, since linux pretty much powers the Internet along with massive numbers of corporate servers all over the world, not to mention a majority of smart phones in use today, and embedded “IoT” devices, and these days a growing number of pc desktops and laptops…) If you read the post again, the poster didn’t mention linux at all. I think maybe the poster was questioning (in an unnecessarily disrespectful manner) some of the statements you made in your original post. There’s paid-software, and free/FOSS software. And there’s software that’s more user-friendly, and software that’s less user-friendly. But I’m pretty sure any correlation between these largely-independent categories/ranges would be weak–if it exists at all. In other words, there is good and bad software, good and bad code, good and bad choices made, on both sides of the paid/FOSS fence. As mentioned above, there’s both user-friendly software and not-so-user-friendly software on both sides of the paid/FOSS fence. I’m sure you’re not trying to insult the windows sysadmins. But I assure you that good windows sysadmins are highly-knowledgeable about Windows systems, just as good linux sysadmins are highly-knowledgeable about linux systems. Seriously? With all the complaints these days about Windows10 (“Windows-As-A-diSservice”), frequent forced updates, patching problems, end users as beta testers, etc. I mean, you were clearly trolling here, right? Linux is not a for-profit company. Linux, and more broadly FOSS, is a movement, simultaneously pursuing both the digital manifestation of a grand idea and the practical solution of real-world problems. Rock on Linus! Rock on GNU! So, your Point 1, 2, 3 and 5 are out-of-context. We are talking about OS software, ie Windows vs Linux, and not about programs or apps = apples and oranges. ……. I was referring to Windows in general and you were picking on Win 10. Actually Win 10 Ent LTSB which is similar to Win 7, is quite user-friendly – if only all Win 10 were like that. Point 4 – My point is that a person needs to know much more about computers, in order to qualify to be a Linux System Admin, compared to qualifying to be a Windows System Admin, as I have shown in my earlier post. Point 6 – Only an income-generating OS, eg from M$-Windows or Google-Android/Linux, has the financial resources to develop the OS and make it easy to learn, use, understand, deal with or user-friendly in various use cases. ……. Most computer users do not want to deal with Linux Terminal commands, ie they just wanna point-and-click. Imagine Google requiring Android users to do Linux Terminal commands for certain advanced functions. P S – Linus Torvald needs to get out more from his attic and basement. Linux users are frustrated by how unusable Linux is in their daily lives. And they are desperately trying to bring users to Linux hoping to bring more developers attention to this Linux-as-a-Personal-Computer usecase. linux is not dynamically configuring its drivers. hence the need to “configure” then rebuild. why we need OS ? to make the purchased hardware runs well. apps? it is another story.. but MS wins in this area since that Visual Basic age long ago. put any hardware in (or plug to usb), and it will self configure everything. Linux heaven. no kernel compile. no configs. but… now win10 needs “net stop xxxxx” “net start xxxx” “rename folders”… so going back to the old times is trending? I saw that in the new LTSC they added the people icon on the taskbar. LTSB did not have that. Is it safe to assume that they have also added calendar, people, mail, etc. I think I will stick to LTSB if they have added those “features.” I dont need additional apps running in the background. Is there a link from Microsoft that mentions the change to LTSC from LTSB?